Věra Chytilová's debut feature confirmed as coming soon in the latest newsletter. Her short film A Bagful of Fleas (Pytel blech) will be included. Last edited by antnield on Tue Jan 19, 2016 6:54 pm, edited 1 time in total. Will this be available to pre-order soon? the year's running out, and I'm eager to start my Cytilova-thon. Something Different (1963) follows the lives of two women – a gymnast in gruelling training (real life Olympic gold-medallist Eva Bosáková), and a dissatisfied housewife (Věra Uzelacová). The two strands never meet but provide a progressive comment on each other and the differing roles of the women. In A Bagful of Fleas (1962), the everyday world of young factory girls’ lives in the cotton mills of Náchod conflicts with officialdom. Presented from all-new HD materials, these two terrific early works from Věra Chytilová introduce themes evident across her career: the feminine point of view in a world of double standards and predatory sexualisation dominated by men, the expectations and strictures of female gender roles, and a strong critique of contemporary society. Combining elements of cinema vérité and formalism, and spiked with anarchic humour, her films broke with both genre and ideology and charted a new path for Czechoslovak and Eastern European cinema. Press release gives a date of February 29th. Now up for pre-order at Amazon - and also soon at the Arrow Video website. I'm greatly looking forward to this as I've only seen the films on fuzzy off-air copies so far. "Something Different by Czech filmmaker Věra Chytilová is rather extraordinary... compelling and experimental and deeply concerned with the female perspective... the realization that it was her very first feature-length effort, not even counting its place as one of the key beginnings of the Czech New Wave, is simply amazing... Chytilová’s terrific and audacious debut feature is joined by an earlier short film in this typically valuable Second Run DVD release"
Clydefro Jones at Digital Fix on Chytilová’s SOMETHING DIFFERENT / A BAGFUL OF FLEAS - which is OUT TODAY! "A cast-iron argument that she was one of the greatest and most innovative film-makers of all time"
"Astonishingly fresh and inspired... 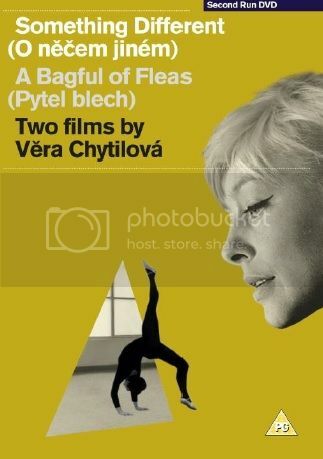 Her 1962 A Bagful of Fleas, a world premiere on DVD that looks resplendent after its 2k restoration... Something Different only extends the director’s range... Chytilová created something with a poise that defies us not to be seduced by it"
"The always-excellent Second Run brings two earlier films to DVD for the first time - Chytilová's 1963 debut Something Different, and her startling 43 minute featurette A Bagful Of Fleas - and provides a terrific entrée into the world of a film-maker who was still working in her 70s... beguiling and unflinching portrait of women and the choices and sacrifices they make"
"Chytilova's striking feature debut SOMETHING DIFFERENT, which is as great and as important as her kaleidoscopic, anarchic 1966 classic DAISIES"
Věra Chytilová's SOMETHING DIFFERENT / A BAGFUL OF FLEAS reviewed by Michael Brooke in the latest Sight & Sound. Filmstruck US is currently running a collection of Věra Chytilová films including DAISIES, FRUIT OF PARADISE and SOMETHING DIFFERENT. Filmstruck will also be launching shortly in the UK.